Quite a few of my clients are surprised to find out that we have Florida bluefish. Experienced anglers from the Northeast and mid Atlantic are quite familiar with this saltwater brawler. However, Florida has a good population of them as well. Bluefish are the sole member of the family “Pomatomidae”. They are a pelagic species, meaning they spend their time in the middle of the water column. They are widely distributed throughout the world. Anglers from Maine to the Carolina’s target them from boats, jetties and peers, and the surf. Pound for pound, bluefish are one of the strongest fighting game fish in the sea. Florida has them in good numbers most of the year. Most of the bluefish that we see in Florida are smaller than their northern brethren. Here in Sarasota, Florida where I guide, bluefish average 2 pounds and a 5 pound are is a nice fish. However, though they are smaller, they are just as much fun. This is due mostly to the fact that we fish for them with very light tackle on my Sarasota fishing charters. Florida bluefish are caught in the inshore bays, passes and inlets, and along the beaches. They prefer clean, clear water and water temperatures in the low to mid 70s. Bluefish school up in large numbers and are very aggressive. Often times bluefish will be seen feeding voraciously on the surface. This is a great opportunity as just about any lure or bait cast into the mix will draw strike. Florida inshore bays for the most part are fairly shallow. Grass flats abound. Florida bluefish seem to prefer areas that are a mixture of sand and grass in depths of between six and 12 feet deep. Flats and bays near inlets and passes are generally the most productive. Bluefish require a high level of salinity, they cannot tolerate brackish water. At one point or another every mile of the Florida coast will experience some type of bait fish run. Predators will usually not be very far behind. This includes Florida bluefish as well. East Coast anglers experience the famous mullet run while on the West Coast it is more thread fin herring and Spanish sardines. No matter what the bait fish being pursued, there are few angling circumstances that can compete with breaking fish when it comes to pure excitement! The sight of a school of game fish terrorizing hapless bait fish on the surface is exhilarating. Also, anglers know that just about any bait or lower tossed into the mix will draw a strike. While many anglers target Spanish mackerel, false albacore, and other species, bluefish can be often found in these feeding frenzies. This is one instance whether anglers can bump up the leader to steel and not see a market decrease in strikes. These fish are usually so fired up and aggressive that they will hit a spoon, plug, or jig with reckless abandon. This is a fun and exciting Sarasota fishing charter! Many bluefish are landed by anglers seeking other species. A very popular technique in Florida is to drift the grass flats while casting a lower or live bait in search of fish. 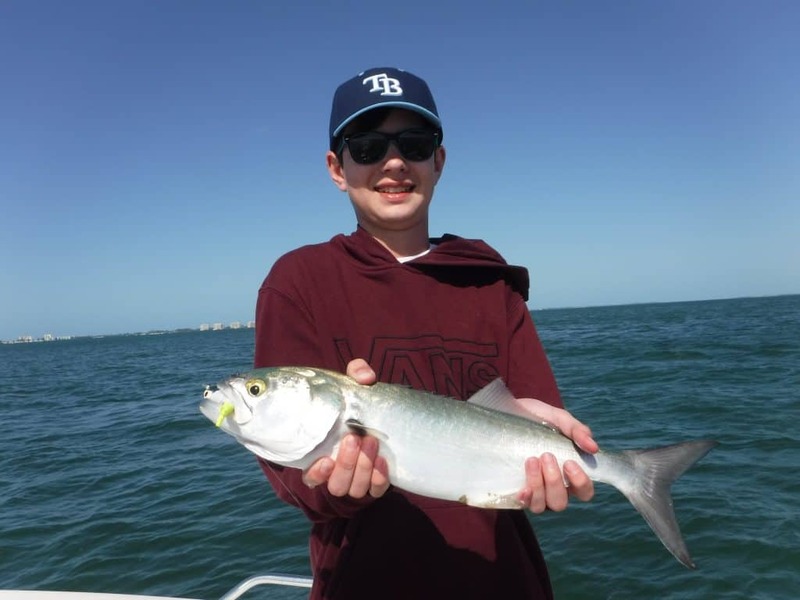 Anglers will encounter schools of Florida bluefish while doing this. When one fish is caught, expect more to follow. Bluefish will sometimes be seen feeding on the surface, but quite often there will be no indication of their presence until one is hooked. Florida bluefish are very aggressive and a fast-moving lure will get their attention. Jigs, spoons, and plugs are the most popular artificial lures. If I was targeting bluefish or was fishing in an area where I knew they could be present, I would choose a jig and grub as my preferred lure. Jigs are my preference when fishing for Florida bluefish for several reasons. Most importantly, they are effective and catch fish. But there are other reasons as well. Bluefish have very sharp teeth and cutoffs will occur. In clear Florida waters, a fluorocarbon leader will produce many more strikes than a steel leader will. For this reason, lures and hooks will be cut off by bluefish. Jigs are relatively inexpensive. They also have one large single hook, making handling and releasing bluefish easier. 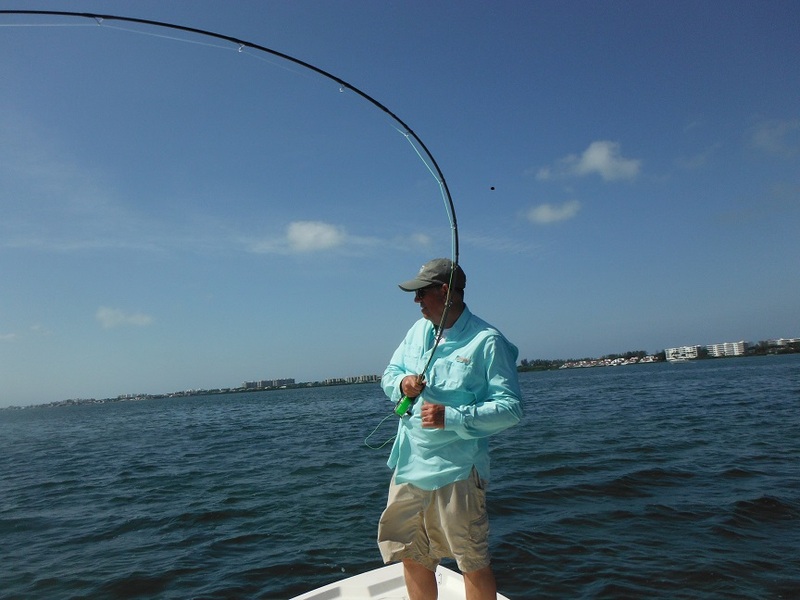 Spoons are another effective lure when targeting Florida bluefish. A 1/2 ounce spoon is very aerodynamic and will cast a long way on light spinning tackle. Silver is the preferred color in clear water. Most casting spoons come with a trouble hook which can be easily replaced with a single hook if desired. A snap swivel at the lure or a swivel between the leader and running line will reduce line twist. Plugs are very productive when chasing Florida bluefish. It is very exciting to see bluefish blowup on a top water plug! However, there are a couple drawbacks to casting plugs. Plugs are expensive with the average cost being around $10. Several anglers casting into a school of bluefish can lose a fair amount of money quickly! Also, most plugs come equipped with trouble hooks. These can be dangerous when trying to unhook an angry bluefish. Anglers who enjoy catching their fish on a fly rod will find bluefish to be great fun! Since most of the Florida bluefish run between two and 5 pounds, and eight weight outfit is perfect. The best line choice would be an intermediate sink tip line. This will allow the fly to get down in the water column and still be stripped back quickly. As the spin fishing, bluefish respond best to a fast retrieve. A 9 foot tapered leader with a 24 inch section of 40 pound bite tippet is a good all-around choice. When bluefish are feeding aggressively, the fly choice really isn’t that important. If I had to choose one fly, it would be in all white Clouse Minnow with 3/16 ounce eyes tied on a number one hook. However, just about any bait fish imitations will produce. One trick we use here in Sarasota is to tie are flies on a long shank#1/0 hook. The longer shank acts like a steel leader and reduces cutoffs without reducing the number of strikes. While casting artificial lures and flies is great fun, many bluefish are caught using live and cut bait as well. Live shrimp and live bait fish are the top live baits. Mullet, squid, and sardines are the top cut baits. In reality, any fish that is legal to keep can be cut up and used effectively as bait. Anglers choosing to surf fish almost always opt for cut bait. It really just is a practical decision and is effective. The East Coast beaches tend to have higher waves and rougher surf. Cut bait stays on the hook better during a long cast and with the stronger current and wave action. Bait can be cut into long narrow strips or into chunks. Pier anglers often times use cut bait as well. The best rig when using cut bait to surf fish for Florida bluefish is the fish finder rig. This consists of a narrow tube with a big clip on. The running line passes through the tube and then is tied onto a swivel. A 2 foot to 3 foot leader is attached to the other end of the swivel and then a large hook is attached to the other end of the leader. A pyramid sinker of appropriate weight given the wind and tide is attached using the clip. Anglers can certainly use live bait when surf fishing as well. This is particularly true on the West Coast of Florida where the wave and tide action is generally more gentle. When using live bait, the best approach is to use the least amount of weight possible. Anglers will find bluefish on the West Coast quite close to shore, often in the first trough. Anglers drifting over the grass flats and in the passes will catch Florida bluefish on live bait. One technique that works really well is to free line the bait. This means that the shrimp is hooked on to the hook with no weight being added to the line. The shrimp or bait fish then swims naturally in the water. Since bluefish are often high in the water column, this is a very effective technique. To reduce cutoffs, a long shank hook is preferred. Passes and inlets are virtual fish highways that game fish and bait fish use to migrate between the inshore bays and the Gulf of Mexico and Atlantic Ocean. These are natural spots to find bluefish. Currents can be strong in these areas, so artificial lures are usually a better choice. Anglers can cast to rocks and rip rap or bounce a jig vertically along as they drift. Once again, keeping an eye out for surface activity will increase the chances of success. 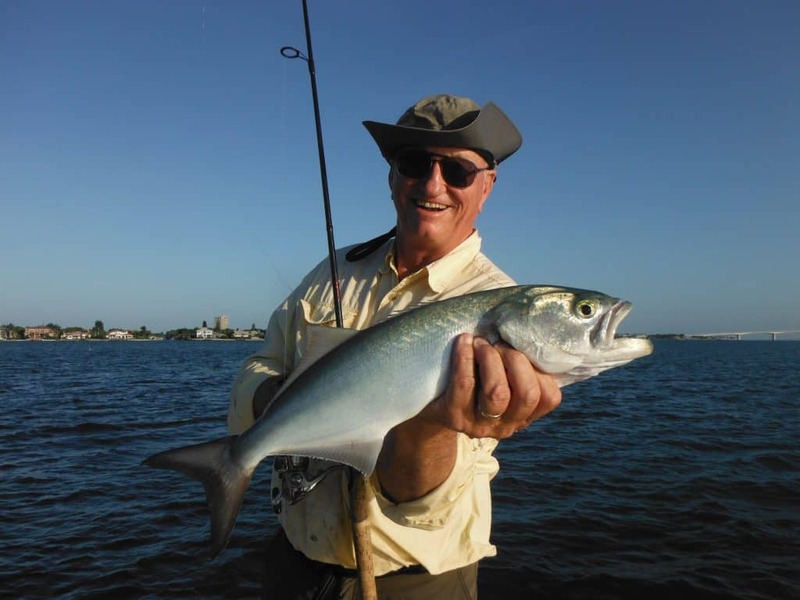 There are several spots here in Sarasota that consistently produce bluefish. Probably the most reliable area is called the middle grounds. It is a large area with a sandy bottom and grass growing out to 10 feet deep. It lies just north of New Pass on the west side of Sarasota Bay. This spot is adjacent to new pass, which gives it excellent current flow. It is a large area and drifting is usually the best approach. Jigs are the best lure to use when fishing for bluefish at that spot. The fish can be out into the water is deep is 12 feet, and jigs will get down deep enough to cover the water column effectively. Spoons and plugs can be used when fish are seen actively breaking on the surface. There are several other flats that produce bluefish in Sarasota. The area between Bird Key and Siesta Key is just east of Big Pass and is another spot that produces bluefish regularly. Further North and Sarasota Bay, Bishop’s Pt., Stephen’s Pt., and Buttonwood are good deep grass flats that produce bluefish. Both passes can be good spots for bluefish, especially in the cooler months. Fish use these passes to migrate between Sarasota Bay and the Gulf of Mexico. Bluefish will often be seen foraging on the surface. Sometimes Spanish mackerel will be mixed in as well as ladyfish. When surface activity is not seen, drifting with jigs will help anglers locate fish. Point of Rocks off of Siesta Key is a spot along the beach that will concentrate bluefish. There is not a lot of structure along the beach, with the exception of the spot. That is why it attracts so many fish. It is a large area with rocks that protrude out into the water. Bluefish and many other game fish can be caught at the spot. In my opinion, bluefish get a bad rap when it comes to eating quality. The smaller bluefish and the 2 to 3 pound range are delicious! However they do require a bit more care. I bleed any bluefish that I plan to keep. I do this by cutting the gills and putting the fish in the bait well. This will result in the fish pumping all the blood out of its body, making the flesh not quite as dark. Then, I get the fish on ice as quickly as possible. Bluefish are oily and do not freeze well. Keep only what you need for a meal that evening. There is an area of darker meat on the backside of the fillet. On larger fish, this area can be cut out for cooking. On smaller fillets, it is best to cook it and work around the dark strip if desired. This darker meat is perfectly safe to eat, some people just find it a bit unappealing. My favorite recipe when preparing bluefish is very simple. I preheat an oven to 400° then cover both sides of the bluefish filet and a tire breadcrumbs. Tire breadcrumbs have plenty of seasoning which makes things nice and easy along with making a nice c crust. Thin lemon slices are placed over top of the fillets in the fishes baked for 8 to 10 minutes. I can then be served with a lemon dill sauce or any other sauce that is preferred. Bluefish are also good grilled, smoked, and used in chowder. Florida buefish regulations can be found HERE.